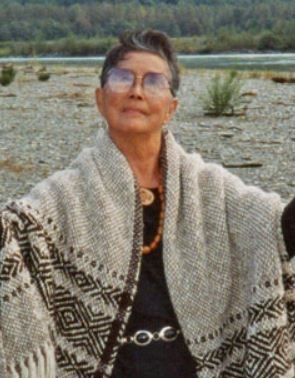 Photo courtesy of Lushootseed Research. The Lushootseed, also known as the Puget Salish or Southern Coast Salish, are a Native American language group constituting several tribes in Washington state with some being more distinct than others. Depending upon the tribe or reservation, the various Lushootseed peoples include the Duwamish, Nisqually, Skagit, and Snoqualmie. Lushootseed comes from two words, one meaning "salt water" and the other meaning "language," and refers to the common language, making up of the various tribes local dialects. They are active at preserving their language, see Tulalip Lushootseed. Their culture centers around the rich traditions of Huchoosedah, a term meaning cultural knowledge and knowledge of self. 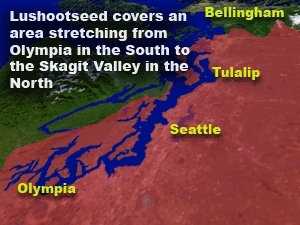 They reside near Bellingham, along the eastern shores of Puget Sound through Seattle, Tacoma, Nisqually, Olympia and Shelton, as well as some areas such as Suquamish near Poulsbo. They are influenced by the Indian Shaker Church, a unique blend of American Indian, Catholic, and Protestant beliefs and practices. The Indian Shakers are unrelated to the Shakers of New England (United Society of Believers) and are not to be confused with the Native American Church. Most people claim them to be a cult, that is not Christian nor adhering to evangelical beliefs. Pray that Lushootseed will take the time to study the Bible and learn from its teachings concerning God's love as revealed through Jesus Christ. Pray Christians will share God's Word and message of the Gospel as recorded in the Bible. Pray for God to work in the lives of Lushootseed people to make Christ and the message of the Bible a natural part of their everyday life.